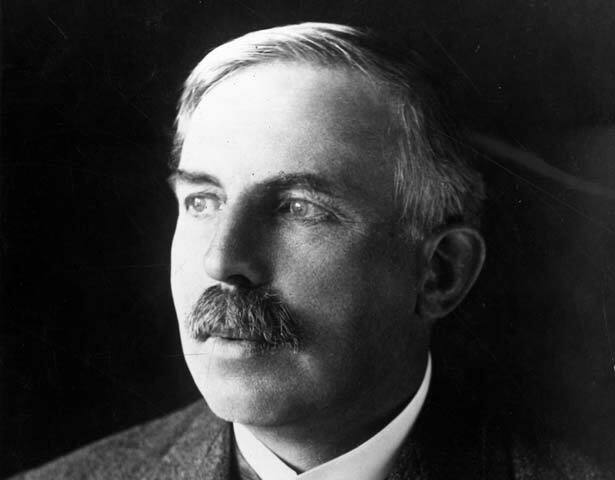 Ernest Rutherford was born near Nelson in 1871. ‘Ern’, as he was known by his family, later claimed his inventiveness was honed on the challenges of helping out on his parents' farm: ‘We haven't the money, so we've got to think’. His mother, who believed ‘all knowledge is power’, made sure her children had a good education. After gaining three degrees at Canterbury College, Rutherford won an Exhibition of 1851 scholarship and used it to study at the Cavendish Laboratory of the University of Cambridge. Nicknamed ‘crocodile’ (because crocodiles always look forwards), he became known for his ability to make imaginative leaps and design experiments to test them. In 1898 he accepted a professorship at McGill University in Montreal, returning to New Zealand briefly to marry Mary Newton, the daughter of his former landlady. It was at McGill University that Rutherford made the first of three major breakthroughs of his career: the discovery that atoms of heavy elements have a tendency to decay. This heralded the ‘carbon dating’ technique still important in science today. Rutherford returned to England in 1907 to become Professor of Physics at Manchester University. Here he produced his second breakthrough – a new model of the atom as a tiny nucleus surrounded by orbiting electrons. During the First World War, Rutherford worked on acoustic methods of detecting submarines – and unsuccessfully tried to persuade the United States government to use young scientists for research rather than in the trenches. It was not his first cause. He had campaigned for women to share men's privileges at Cambridge University, and spoken up for the freedom of the British Broadcasting Corporation from government censorship. In 1917 Rutherford claimed that he had 'broken the machine and touched the ghost of matter’. In his third major breakthrough, he had succeeded in 'splitting' the atom – making him the world's first successful alchemist. This research was published in 1919, the same year he became Director of the Cavendish Laboratory. There he proved a humane and supportive leader who never failed to let his students take credit for research he had mentored. On his final trip to New Zealand in 1925, Rutherford was received as a national hero and gave talks to packed halls around the country. His call for government to support education and research helped drive the establishment of the Department of Scientific and Industrial Research (DSIR) the following year. In 1908 Rutherford received a Nobel Prize for his work on the disintegration of elements. He was knighted in 1914, decorated with the Order of Merit in 1925 and made a Baron in 1931, choosing for his coat of arms a design that included a kiwi and a Māori warrior. Many scientific institutions, streets and school houses bear his name and his image appears on the $100 note and on a stamp issued by New Zealand Post in 2008. He is the only New Zealander to have an element – rutherfordium – named in his honour. (The mineral rutherfordine is also named after him). Rutherford died in 1937 of complications from a hernia. Years before, in the midst of the First World War, he had expressed the hope that no one would discover how to extract the energy of the atom until man was ‘living at peace with his neighbours’. Nuclear fission, which made possible the use of nuclear power, was discovered two years after his death. We have 2 events in history, 2 biographies, 4 comments related to Ernest Rutherford. What's your authority for the interpretation of "crocodile". I seem to remember that the Russian scientist George Gamow in his biography of Physics? commenting on it that the crocodile was regarded as a magnificent and powerful creature. Hi, curious as to why you say splitting the atom makes him the world's first successful alchemist? Hi Nono - this was the 'splitting' of the atom mentioned in paragraph six. I'll look at rewording this slightly to make it clearer that this was the third breakthrough.